MUSKOGEE, Okla. — Low water levels on the Arkansas River are providing distinct advantages to the anglers who can get shallow, as the top two anglers in the Bass Pro Shops Central Open on the Arkansas River utilized shallow draft jet boats to access fish the rest of the field couldn’t reach. The majority of big fish on Day One came out of the Grand River for anglers fishing along rocky bars and way up in shallow creeks. One-hundred thirty-six boats boomed out of Three Forks Marina on the Arkansas River this morning for Day One of the Bass Pro Shops Central Open in Muskogee, Okla., most of which are fishing in a 95-mile stretch of the 421-mile river system that’s filled with shad. Among the competitors on the boater side are 10 Bassmaster Elite Series pros including Tommy Biffle, in first after Day One with a five-fish bag limit weighing 18 pounds, 12 ounces. Biffle was utilizing an aluminum boat with a jet drive outboard to get into the shallow areas that are holding some of the larger fish. “I had to go through some nasty areas with only six or seven inches of water and hard rock bottom,” said Biffle. “The fish in the river system have been beat up in practice the last week or so, so I thought I’d take my aluminum boat and get to where the other anglers can’t get and take my chances. I think I’ve got enough fish for three days. Biffle borrowed the jet boat rig from one of the local marinas and caught six or seven fish on a bite that was over early. Jet drive outboards don’t have props and push the boat using air, allowing the boat to maneuver through shallow and often rocky bottom. Also fishing out of an aluminum boat with a jet drive outboard was Muskogee High School graduate Janet Parker, who was the first angler to weight in on Day One. Parker’s 15-pound, 2-ounce five-fish limit was good for second place. Parker’s bites came early and later in the day. Many of the anglers fishing the pro division had a tough day on the water, with only about a quarter of the field catching a five fish limit. Sitting in third place in the pro division is Dewayne French with 14 pounds, 13 ounces from a five-fish limit he caught fishing shallow with jigs and worms. 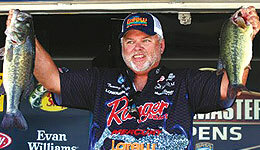 In fourth is Louisiana pro Mark Smith, with a five-fish limit weighing 14 pounds, 5 ounces. Smith’s co-angler Darryl Hanks also had a good day. Rounding out the Top Five in the pro division after Day One was Lendell Martin, who brought four fish to the scales weighing 12 pounds, 13 ounces. Just behind Martin in sixth place is Elite pro Rick Clunn, with 12 pounds, 11 ounces. Anglers fishing in the Pro Division can weigh in up to five bass per day, with a 14-inch minimum size limit. The Co-Angler Division allows up to three bass per angler. The Arkansas River is producing a mixture of Kentucky bass, largemouth bass and smallmouth bass, with many of the anglers reporting lots of action from the sub-limit fish. After the Day Two weigh-in tomorrow, the Top 12 Pros and Co-Anglers will advance to fish the final day. Up for grabs in the pro division is a Triton 19XS bass boat with 200-hp Yamaha outboard. With the water levels low on the Arkansas River, the boats with jet drives and those finding access to shallow creeks have a distinct advantage over the rest of the field. Many of the local anglers are hoping the water level will stabilize and clean up, which will help the deeper sections of Arkansas River fish a lot better on Day Two.